Rising US yields, stronger dollar, FX outflows from emerging markets into US equities, President Trump’s still uncertain policies regarding global trade and country-specific concerns continue to weigh on EM currencies. But the pace of depreciation in EM currencies has abated, with a number of central banks hiking their policy rate and likely intervening in the FX market. China is manipulating its currency but perhaps not the way that US President Trump thinks. With the market having almost fully priced in a December Fed hike, it will focus on FOMC members’ likely further downward revision to their forecasts for the appropriate policy rate. Commentators are making a number of assumptions about next year’s French presidential elections and the potential impact on the euro. Some seem reasonable, others less so. The first assumption is that Fillon will beat Juppé in the second round run-off of the Republican primaries on 27th November. This is indeed the most likely outcome. The second assumption, which I agree with, is that no presidential candidate will clear the 50% threshold required in the first round of the elections on 23 April to become President. The third assumption, now seemingly hard-baked, is that no Socialist candidate stands even a remote chance of making it to the second round of the presidential elections on 7th May 2017. I would argue that it is too early to write off that possibility. The fourth assumption, which I believe is still far-fetched, is that Front National leader Marine Le Pen could win the second round to become President, which in turn would precipitate France’s exit from the EU and pressure the euro. UK markets’ mixed reaction to Wednesday’s Autumn budget was in line with my expectations of higher yields and stronger Sterling. Chancellor Hammond’s modestly stimulative package reflects the realities and uncertainties which the UK economy has faced since the June referendum. This is still the over-riding theme markets will have to deal with in the near and potentially long-term. Hammond had one hand behind his back and a moving target to hit. He has backloaded spending to 2018-19 and beyond with a focus on infrastructural projects to boost languishing UK productivity. The EU Parliament’s overwhelming vote on 24th November to suspend Turkey’s EU membership talks, which has pushed USD-TRY to a record high of 3.45. The Reserve Bank of India’s decision on 8th November to ban the two largest Rupee bank notes which has undoubtedly contributed to the currency’s 3.2% sell-off versus the dollar. The slowdown in Indonesian GDP growth in Q3 to a weaker-than-expected 3.2% qoq from 4.0% qoq in Q2. The Singapore government’s downward revision on 24th November of its 2016 GDP growth forecast to 1.0-1.5% from 1-2% following confirmation that GDP growth had contracted at a seasonally-adjusted annualised rate of 2% in Q3. In Taiwan, flat-lining export orders in October and a further slowdown in industrial output growth to 3.7% yoy from 4.6% yoy in September. 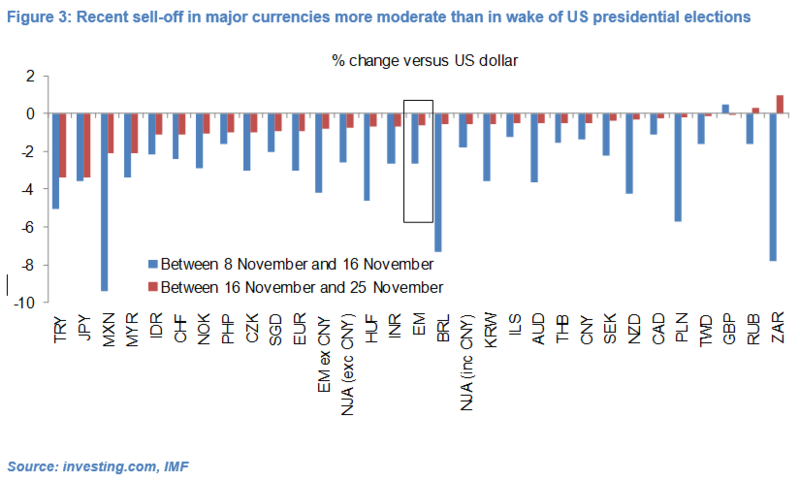 However, the pace of depreciation in EM currencies in the past nine sessions has slowed markedly following the collapse in the eight sessions following the US elections on 8th November (see Figure 2). The Russian Rouble and South African Rand have even managed to eke out small gains versus the dollar (see Figure 3). A number of EM central banks have shown a willingness to counter, or at least slow, the collapse in their currencies. The central banks of Mexico and Turkey hiked their policy rates 50bp on 17th November and 24th November respectively. Moreover, there are reports that some Non-Japan Asia (NJA) central banks, including Bank Negara Malaysia, Bank Indonesia and the People’s Bank of China (PBoC) may have intervened in the FX market to provide local currency support. EM currencies’ fight-back admittedly remains timid so far and the overwhelming consensus seems to be that capital outflows from emerging economies and market bearishness about EM assets will continue to outweigh central banks’ ability and willingness to steady their currencies. 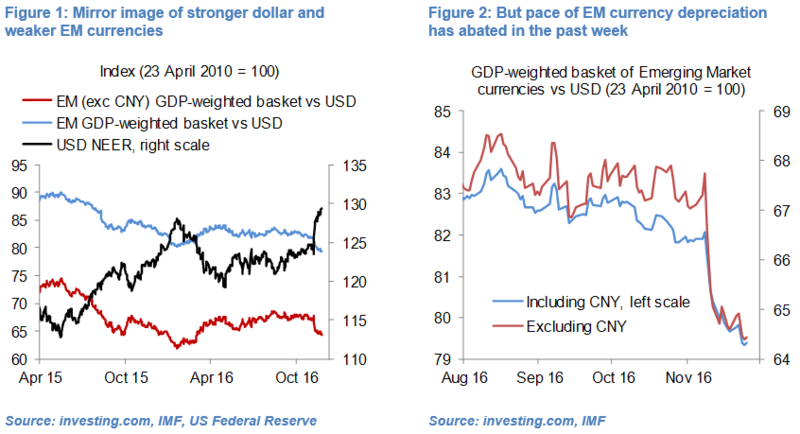 US Federal Reserve – EM saviour in disguise? An increasingly likely Federal Reserve (Fed) rate hike on 14th December has been put forward as an argument against any-term recovery in EM asset prices. Indeed, the minutes of the Fed’s November policy meeting – released on 23rd November – have further turned the dial towards a December hike. Barring a shockingly weak set of November data for manufacturing ISM (due out on 1st December) and the labour market (due on 2nd December), the Fed will likely hike its policy rate 25bp next month – in line with my expectations (see Fed – Sense of Déjà-vu, 7 September 2016). But such a decision is already priced in by the US rates market, which attributes a 94% probability of a December hike, and is therefore likely already priced in by EM markets. The Fed’s accompanying statement and revised forecasts, as well as Yellen’s Q&A session, will arguably be more relevant for global risk appetite than the decision to hike itself. The Fed will certainly want to avoid a repeat of Q1 2016 when global equities and EM currencies sold off and the dollar appreciated in the wake of its 16th December 2015 rate hike. It will therefore likely reiterate its well-worn message that further rate hikes will be data-dependent and in any case slow and gradual. Moreover, I would expect FOMC members to further revise down their estimates of the appropriate policy rate as they did at their December 2015 meeting. Back in September, the weighted average of FOMC members’ appropriate target level for the Fed fund rate implied one 25bp hike before end-2016 and a further 65bp and 80bp of hikes in 2017 and 2018, respectively (see Figure 4). I would be surprised if the nearly six 25bp hikes which FOMC members deem appropriate in 2017-2018 were not pared back to below five hikes. The Fed’s success in communicating this message to a market sensitive to even the most benign Fed utterance will be a key determinant of whether (and how sharply) global risk appetite rebounds in the weeks following 14th December. The collapse in the Chinese onshore Renminbi to record lows versus the dollar, which has grabbed media headlines, has led to the conclusion, erroneous in my view, that the PBoC is actively pursuing a devaluation policy. The Renminbi’s depreciation is largely a product of dollar strength. 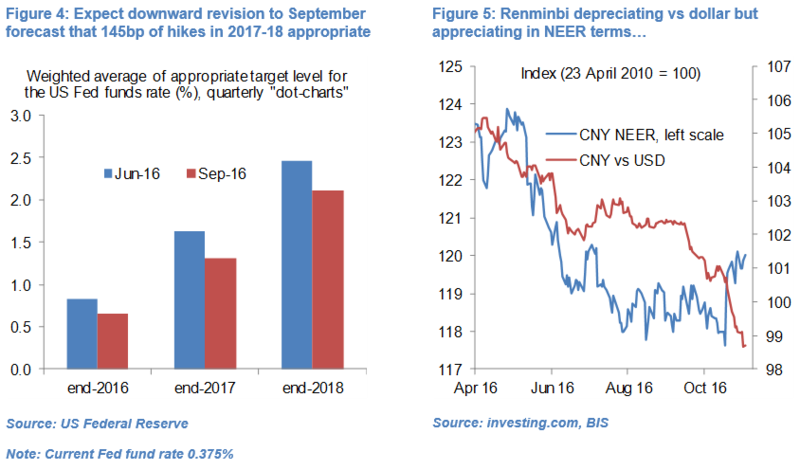 Indeed the Renminbi Nominal Effective Exchange Rate (NEER) was stable in August-October and has appreciated about 2% since the US presidential elections (see Figure 5). 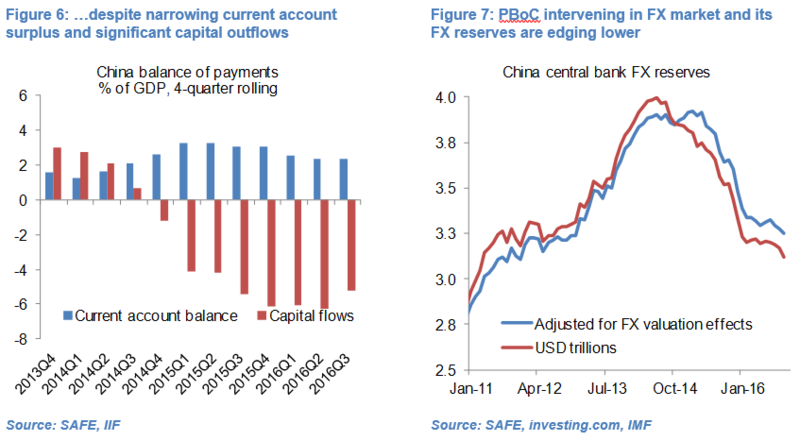 The Renminbi’s stability despite a narrowing of China’s trade and current account surpluses and significant capital outflows would suggest that the PBoC continues to intervene in the FX market to stabilise the currency (see Figure 6). The dollar-value of FX reserves fell about $85bn between end-June and end-October. Even accounting for estimated currency-valuation effects (namely dollar strength) central bank FX reserves fell about $60bn during that period, according to my estimates (see Figure 7). I would expect data due for release on 7th December to show that FX reserves fell further in November. Going forward, FX reserves are likely to remain under modest downward pressure if as I expect the PBoC continues to intervene in the FX market to keep the Renminbi NEER broadly stable. This may still fall short of stopping US President Trump from carrying out his threat to officially label the Renminibi as undervalued and the PBoC a currency manipulator. But the backdrop of capital outflows from China (and general pressure on EM currencies), falling FX reserves and a Remninbi NEER broadly stable since mid-year would arguably test the credibility of such an approach by President Trump. With the first round of the French presidential elections only five months away, commentators are making a number of assumptions, which would have real implications for France’s economy and arguably the euro. Some seem reasonable, others less so. The first assumption is that François Fillon will beat Alain Juppé in the second round run-off of the Republican Party primaries on 27th November. This is indeed the most likely outcome. Fillon confounded opinion polls by convincingly winning the first round of the primaries on 20th November with 44.1% of the national vote (which was in practise open to all in exchange for a €2 payment), pushing Alain Juppé – long viewed as the front-runner – into second place with 28.6%. Moreover, Nicolas Sarkozy – who came third with 20.7% of the vote – has publicly endorsed Fillon. Finally, it is likely that only a fraction of the 600,000 socialist voters who reportedly voted for Juppé in the first round will vote in the second round. The second assumption is that no presidential candidate will clear the 50% threshold required in the first round of the elections on 23rd April to become President outright. I would agree with this – the constellation of presidential candidates from a broad spectrum of political parties will likely result in a disperse vote in the first round (as has been the case in previous presidential elections), with no candidate likely to win more than 30-40% (see Figure 8). The third assumption, now seemingly hard-baked, is that no Socialist candidate stands even a remote chance of making it to the second round of the presidential elections on 7th May 2017. François Fillon and Marine Le Pen are seen as more than likely to win the first and second spots in the first round of the presidential elections on 23rd April 2017. I think that the third, and in particular fourth, assumption are open to debate. Recent opinion polls show that whichever presidential candidate wins the Socialist Party primaries in January, he/she would get no more than 10-15% support in the first round of the presidential elections. President Hollande and Prime Minister Valls, who have yet to declare their candidacies, and Montebourg (who has declared his) would all languish in fifth or even sixth place in the first round of the presidential elections, behind Le Pen (far-right), Fillon (Republican), former Economy Minister Macron (independent), Mélanchon (far-left) and Bayrou (centrist) who has yet to declare his candidacy. UK bookmaker Betfair currently has odds for Valls or Hollande to become President of 50/1 and 80/1 respectively. But while a Le Pen versus Fillon run-off in the second round of the presidential elections still seems like the most feasible scenario, it is not yet a given, in my view, that the Socialist Party candidate will come nowhere near second (let alone first) in the first round of the elections. Five months is a long time in politics and I highlight below six factors which suggest it is simply too early to write off left-leaning policies and the possibility of a Socialist Party candidate making it to the second round of the presidentials. We will not know the Socialist Party’s presidential candidate until the second round of the primaries on 29 January 2017 (see Figure 8). At present, we do not even have a final list of candidates. President Hollande will reportedly confirm only on 10th December whether he will be put forward his candidacy. Prime Minister Valls and Ecology Minister Ségolene Royale, political heavyweights in the Socialist Party, are seemingly leaning against not running but have not confirmed either way. The prevailing assumption is that incumbent president François Hollande, whose popularity has collapsed to 4% in recent polls, will not put forward his candidacy for fear of being comprehensively beaten in the first round of the presidential elections (or even more humiliatingly not wining the Socialist Party primaries). But Hollande could take a calculated gamble and declare himself a candidate. Manuel Valls and Ségolene Royal have made pretty clear that in this scenario they would not put forward their candidacies and stand behind Hollande (out of loyalty but also likely out of fear of themselves being humiliated with a poor showing in either the primaries or the actual presidential elections). If Hollande does not put forward his candidacy, Valls and/or Royal are likely to put forward their candidacies, with the advantage of both being more popular than Hollande. I would expect either Hollande, Valls or Royal to beat Montebourg to win the Socialist Party primaries and become the party’s presidential candidate. In this scenario, a key question would be whether the vast Socialist Party apparatus rallies behind their candidate in a bid to hold onto the presidency or whether it implodes (as it has done in the UK under Labour leader Jeremy Corbyn) and the Socialist Party candidate finds himself devoid of broad-based party support. A number of reasonably popular candidates – in particular centrist party leader François Bayrou – have yet to confirm their candidacy to the presidential elections. Bayrou has publicly supported Republican candidate Alain Juppé but if Juppé loses to Fillon in the second round of the Republican Party primaries on 27th November – a likely scenario – Bayrou could throw his hat in the ring with a political manifesto which primarily attacks Fillon’s right-wing program. Third, Emmanuel Macron, who is now running as an independent and was third in Sept-Oct polls gagging popular support in the first round of the presidentials, may ultimately struggle in the first round as he does not have a powerful political machine behind him. In the first round of the presidential elections, the right-wing vote could be split between Le Pen and Fillon as their policies, including a scaling back of immigration and religious freedoms and anti-abortion rhetoric, somewhat overlap. This could ultimately work against them and help Hollande or any other Socialist Party candidate gain a greater share of the national vote. The Socialist Party will strongly attack both Fillon and Le Pen’s right-wing policies. Juppé, who will go head-to-head this weekend against Fillon in the second round of the primaries, has already started to aggressively critise Fillon’s more right-leaning fiscal policies. These include cuts to fiscal spending, public sector jobs and unemployment benefits, longer working hours for public-sector employees, a two-percentage point increase in VAT and a gradual increase in the retirement age to 65. The risk is that Juppé’s very public attack weakens the Republican Party and the odds of Fillon making it to the second round of the presidentials. The Socialist Party will undoubtedly use these very same arguments against Fillon (assuming he wins this weekend’s primaries). The Socialist Party, which commands a modest parliamentary majority and holds the presidency, has already started loosening the purse strings which will help them win over lower-income voters. If Fillon and the Socialist Party candidate make it to second round of the presidentials, Fillon is likely to win despite Socialist Party policies still having a strong following in France. But by then I would expect the odds of the Socialist Party candidate winning the presidential elections to have narrowed significantly from current levels. 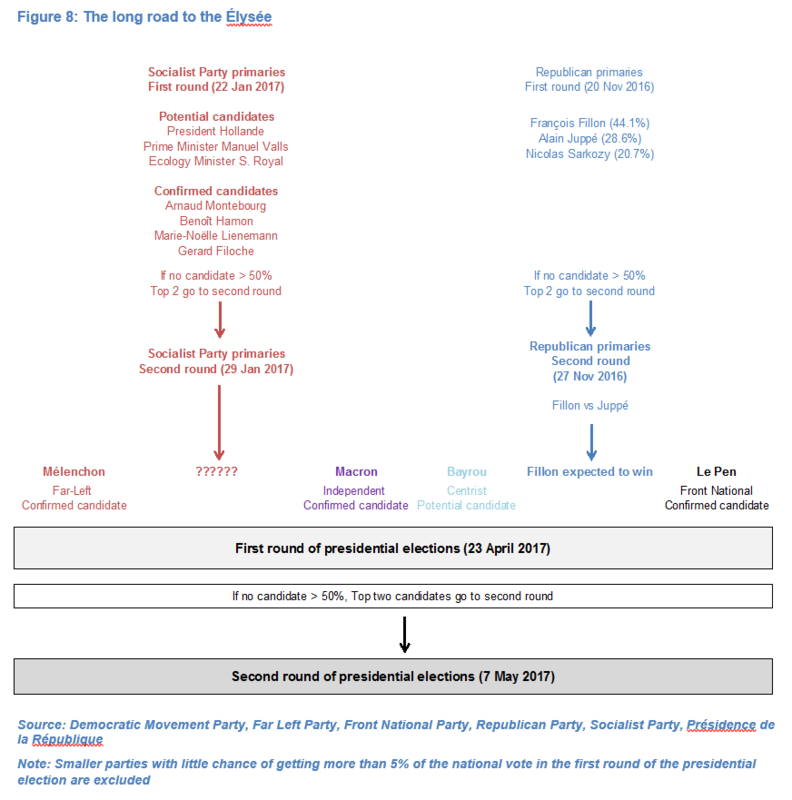 Even if neither Hollande, Valls or Royal make it to second round of the presidential elections, their odds of becoming president may still narrow from current levels between the Socialist Party primaries in January and the first round of the presidential elections on 23 April 2017. The increasingly prevalent idea is that the French electorate is ready to vote through to the highest political echelon an anti-establishment, far-right nationalist candidate and that Le Pen will cause a major upset. Parallels are being drawn with Donald Trump (in the US presidential elections) and British electorate (in the EU referendum) which rode a wave of populism, confounded the polls and ultimately turned the political status-quo on its head. There is little doubt that the FN has been in the ascendancy in recent years, thanks in part to the pressing issues of immigration, terrorism and France’s tepid economic performance under a weak Socialist government and presidency. Marine Le Pen has also been riding the wave of anti-EU sentiment and said that if voted President she would introduce a referendum on France’s membership of the EU. Moreover, she has distanced herself from her father’s more controversial views, helping the party become more acceptable to a wider audience. This may be enough to get her to the second round of the presidential elections but is insufficient for her to win the run-off and become president in my view. For starters, unlike Trump who won votes as anti-establishment presidential candidate willing to shake up the economic, political and social status quo, Le Pen is unlikely to make electoral in-roads as an “anti-establishment” candidate. She has been in politics for 30 years and been Front National leader for five, she is the daughter of the FN’s founder and her niece is also a politician. Like most of the politicians which have so far thrown their hats in the presidential election ring, Le Pen is part of a well-entrenched French political establishment. More importantly, rising popular support for right-wing policies has also helped Fillon. This was demonstrated by his strong showing in the first round of the Republican Primaries on 20th November when he comprehensively beat the more moderate right-wing candidate Alain Juppé. His strong stance against immigration and religious assimilation and in favour of stronger policing will likely help him win over traditional FN voters. At the same time, while Le Pen has toned downed her party’s more extreme policies and views, Fillon arguably remains the more acceptable face of right-wing politics and I would expect him to win over voters slightly to the left of the FN on the political spectrum (see Figure 9). The bottom line is that François Fillon would very likely beat Marine Le Pen, and quite convincingly in my view, in a second round presidential election run-off, as I argued in Nationalism, French presidential elections and the euro (18 November 2016). In the admittedly still unlikely event that a Socialist Party candidate makes it to the second round of the presidential elections, I would expect him or her to lose against Fillon (in line with recent opinion polls) but potentially beat Le Pen (contrary to opinion polls showing that Le pen would win). While Le Pen is likely to benefit from a “protest-vote” in the first round, she is unlikely to get more than 50% of the votes required in the second round to become President. Ultimately, I do not think that the French electorate is yet willing to give presidential power to the FN which it still views as too right wing and lacking coherent economic policies. Last year’s regional elections where the FN got comprehensively beaten in the second round is a useful template of the kind of mountain the party still has to climb. There is a perverse yet compelling argument that France’s situation would have to get far worse for the electorate to be ready and willing to give true power to the FN. That may be the story of the 2022 presidential elections. UK markets’ mixed reaction to Wednesday’s Autumn budget statement reflects the modestly stimulative package which Chancellor of the Exchequer Phillip Hammond announced and the realities and uncertainties which the UK economy has faced since the June referendum. Two-year gilt yields, which spiked briefly to 20bp during Hammond’s speech from 15bp on Tuesday, are back below 14bp, likely reflecting the government’s reasonably conservative new fiscal measures for this year and next. 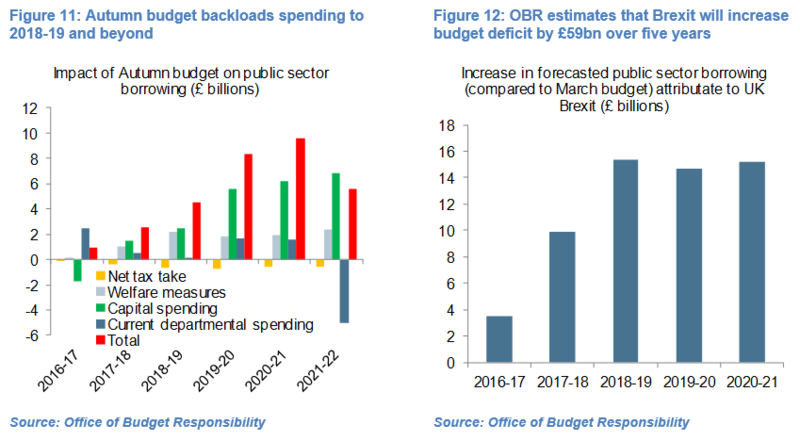 But the government’s backloading of spending measures to 2018-19 and beyond (see Figure 11) and the Office of Budget Responsibility’s forecast that deficit-reduction will hit a brick-wall in 2020-21 (see Figure 10) has likely contributed to a 7bp jump in 10-year yields to about 1.43%. US President Donald Trump’s penchant for reflationary policies has helped the dollar surge in the past fortnight and the “reflation-lite” version put forward by Hammond on Wednesday has helped the Sterling NEER appreciate 0.5% since Tuesday near to a 10-week high, according to my estimates (see Figure 3). From an equities’ perspective Hammond’s very limited tax cuts and Sterling’s rally have taken some of the shine off modest intrastructural-spending plans. The FTSE 100 closed flat on the day and is up only marginally in the past two sessions. This was very much in line with my prediction a week ago that “[Hammond’s fiscal plans] could be sufficient for Sterling to rally and gilt yields to rise modestly” (see Fast and Furious – Market drift, 15 November 2016). While Hammond’s no-nonsense approach is welcome, Theresa May’s government faces serious challenges in coming months which cannot be brushed off with clever budgeting. The uncertain UK economic outlook as a result of the potentially tortuous and ill-defined path of the UK’s exit from the EU was a theme recurrent in Hammond’s budget speech and the OBR’s assessment of British public finances. This is still the over-riding theme which markets will have to deal with in the near and potentially long-term. This was his first ever budget statement and the first since the June referendum in which the British electorate voted in favour of the UK leaving the EU and there was curiosity, rather than hype about what Hammond would and could deliver. 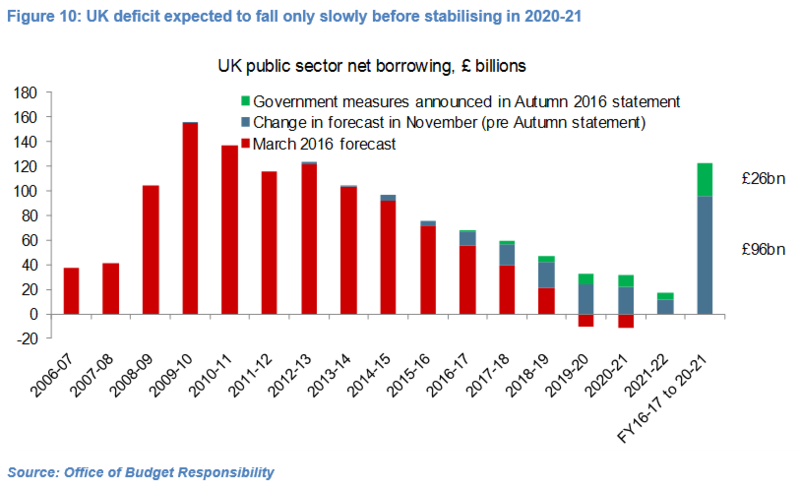 The OBR, set up in 2010 to independently monitor government finances, had already warned last week that government borrowing in the fiscal year 2016-17 and subsequent years would likely be significantly larger than originally anticipated in March by former Chancellor Osborne. Specifically, the OBR had forecast that the cumulative deficit over the five years from FY 2016-17 to FY 2020-21 would be about £96bn larger than originally forecast (see Figure 10). The implication was that the scope for Hammond to further loosen the purse strings would be limited and in the end it was a rather conservative mid-year budget, with new government measures bumping up the cumulative deficit over those five years by a reasonably modest £25.9bn (see Figure 10). As broadly expected, Hammond dropped his predecessor’s plan to run a fiscal surplus by the end of the parliamentary term while sticking to the goal of gradually reducing the deficit over the next five years. It was arguably the backloading of this planned deficit increase to 2018-19 and beyond and the nature of the government’s spending and revenue plans, rather than headline numbers, which stole the show. This was again very much in line with my expectation that “Hammond will likely confirm departure from fiscal restrictions imposed by his predecessor George Osborne while re-committing to cutting fiscal deficit over medium-term (possibly 2019-2020). The likely drag on UK growth from slowing domestic consumption and investment and weaker-than-expected stamp duty receipts will limit his spending plans. Focus is likely to be on infrastructural spending rather than generous tax cuts.” (See Fast and Furious – Market drift, 15 November 2016). The anticipated increase in the budget deficit as a result of the measures Hammond announced yesterday is only £0.9bn in the current fiscal year and £2.5bn in 2017-18 but rises more sharply to £4.5bn in 2018-19 and in particular the following two years to £8.4bn and 9.6bn, respectively (see Figure 11). By his own admission, Hammond is aiming to counteract the potentially negative impact on British public finances and GDP growth of the UK leaving the EU in 2019. In terms of the breakdown of announced measures, there were few tax give-aways beyond the government’s prior commitments and in net-terms the government’s tax take will actually increase by £2.3bn over five years (see Figure 11). Net increases in departmental spending of £6.3bn and in welfare payments of £7.1bn account for about half of Hammond’s planned increase (after taking into account the slightly larger tax-take) of £28.2bn in the fiscal deficit between 2016-17 and 2020-21. This was arguably bread-and-butter budgeting. Perhaps more noteworthy is the planned increase in capital spending of £14.2bn (or £21bn if we include another £6.9bn in 2021-22). The focus is on “high-value” infrastructural investment – including science, innovation, digital infrastructure, housing and transport – in order to address the UK’s languishing productivity, ageing infrastructure and housing shortage. While Hammond’s plan does not quite have the headline-grabbing oomph of Trump’s stated goal of spending $1 trillion on US infrastructure, it is a step in the right direction for a country which has historically treated infrastructure spending as a luxury rather than a necessity. The net result is that the £10.4bn fiscal surplus which Osborne had forecast for 2019-20 has now become a deficit of £21.9bn and the cumulative deficit will be £122bn larger by 2020-21 than predicted in March. The OBR has attributed £59bn of this fiscal slippage to the negative impact on revenues and expenditure which the UK’s departure from the EU in 2019 would have on investment, trade and immigration (see Figure 12). The negative impact from Brexit on public finances (compared to the March budget) is forecast to be reasonably modest in 2016-2017 (£3.5bn) but rise quickly to £9.9bn in 2017-18 before peaking at £15.4bn in 2018-19 and then stabilising at around £15bn in both 2019-20 and 2020-21. The OBR predicts that public sector net debt will increase from £1.61trn (84.2% of GDP) in March 2016 to £1.95trn (£84.8trn) in March 2021, peaking as a percentage of GDP in March 2018 at 90.2%.